ductility, and decreasing the stiffness and the ductility of the tested columns. 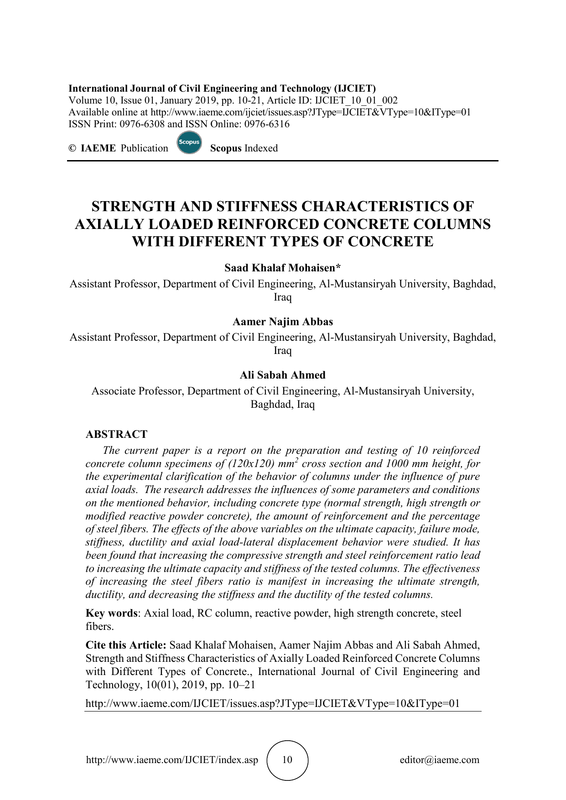 strengthen the reinforced concrete columns has not been widely investigated in the literature. (ɸ[email protected]), see Table 1 below. in Tables 2 and 3. The tests were conducted according to ASTM C-150 . demonstrated in Tables 4 and 5.
program. Table 6 shows the grading of coarse aggregate. flexural reinforcement, and ɸ6 mm deformed mild steel bar was put as shear reinforcement. Table 7 shows the results of tensile test for those bars. Table (8) presents the specifications done by manufacturer of silica fume used in this study. stages of loading application were reached. concrete are mainly straight without significant secondary cracking. 90-degree hooks is thought to be the main factor initiating cover spalling. with high strength concrete specimens free of steel fibers. development of crack width . modulus of elasticity of modified reactive powder concrete specimens . beginning of load application until appearance of first crack. The specimen behaves elastically. in control on the deformations rating of high strength concrete. comparison with reference sample C1. in comparison with reference column C3. indicated by the increase in deflection at failure. at load of yielding, and the latter is greater than the stiffness at failure. (𝜑𝑢) and (𝜑𝑦) are the curvature angles at fracture and at steel yielding respectively. failure in high strength and modified reactive powder concrete columns. enhanced the ultimate capacity of the tested samples. 3. The use of steel fibers improved the ultimate strength. clear in increasing the capacity of ultimate reinforced concrete columns. increasing the longitudinal reinforcement ratio and compressive strength. strengthened with CFRP and SFRP sheets. Polymers, 6(5), 2014, pp. 1381.
with CFRP and GFRP wraps. Master's thesis, American University of Sharjah, 2013. Standard Specifications for Portland cement. ASTM C-150, ASTM International, 2015. Engineering Research and Applications, 2014, pp. 2248-9622. Engineering, 1(1), 2014, pp. 24. Estruturas e Materiais, 3(3): 2010, pp. 271. Conference on FRP Composites in Civil Engineering. Miami, USA, December, 2006, pp. strengthened with wire rope units and steel elements, 2007. Research, Bureau of Engineering Research, University of Texas at Austin, 1998.